What is it about breakfast cereal packaging that disturbs me? This isn't the first time. I was in the grocery store the other day, and I came across this bit of consumer weirdness. There's something freaky about the layout of this box. The little apple and cinnamon creatures are prancing around the logo, with the apple leering at the little girl in an unsettling way. 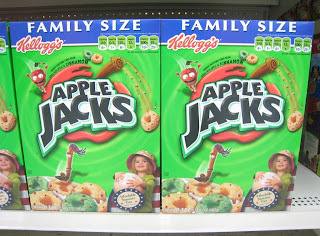 And it looks like the non-animated cinnamon stick is lobbing an apple jack at the girl's head. Creepiest of all is this apple thing. Nothing like good ol' nightmare fuel to start your sugary, vitamin-packed day. 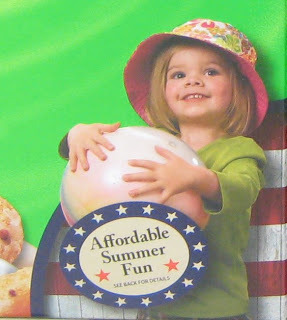 In the midst of all the box top horror, this cute little girl is sitting calmly with her ball and the words "Affordable Summer Fun" splashed across her torso. If the box top is any indication, I would guess that this "affordable" family fun is something you'd find at Camp Crystal Lake or the Bates Motel. 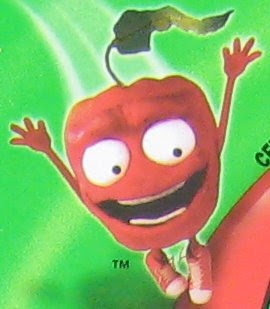 look closely at the animated cinnamon guy...see the brow ring? WTF?